After you decide which one of the many fish finders you want to purchase, comes the often times complicated process of installing the fish finder. Initially setting up your unit may be hard, but don’t assume that will be the hardest part of operating a fish finder. For you to catch any fish utilizing a fish finder, you’ll need to understand how information is displayed on the display screen. If you don’t know how to read a fish finder, don’t be ashamed to say so. Many experienced anglers have never even seen a fish finder, especially because sonar technology only began being used commercially in fairly recent years. Reading fish finders can be complicated, but it’s important to learn this skill before you decide to buy one. If you just wait until you’re on water with your $500 dual beam, CHIRP Sonar fish finder, you’ll soon realize that you might as well have thrown $500 dollars in the water and expected it to lead you to spots where fish congregate. No matter how expensive the fish finder you buy is, you will still be expected to know how to interpret the data shown – you won’t just magically know where the fish are once you turn it on. To read a fish finder, it’s important to know how one works. Sonar waves are emitted from the transducer, or bottom part of the fish finder that is placed in the water. They bounce around and return to the transducer, and the transducer reads the speed, distance, and rate at which these waves return. The transducer then converts this raw data into visual data, usually thick, colored lines and arches. These lines are set at different depths, and you can tell where a fish is based on the depth of where it appears on the fish finder. The first thing you need to be able to understand is a commonly found feature present in most modern day fish finder models. This feature is the depth finder. Many fish finders have a depth sensor on the transducer, and this means that you will be able to tell how deep the water below your vessel is. The depth of the water can tell you the types of fish in the environment, what to expect below you and it can just be helpful in general. Usually on the top left of the fish finder’s screen, the depth will usually be displayed. Often in meters rather than feet, the depth should be clear and fairly accurate, with the accuracy depending on the specific fish finder model that you purchase. Generally, you can see the water temperature directly below the depth reading. This is also useful for locating specific species of fish, as some prefer warm water and others thrive in cooler environments. Utilizing just those two features, you can already start looking for fish and observing the different environments some types of fish prefer. Another useful thing found on most fish finder displays is the speed sensor. The speed sensor displays how fast you are moving, kind of like a speedometer right there on your fish finder. Getting familiar with these things is what makes a better angler and a more experienced fisherman. It’s important to be able to use and appreciate the additional features that fish finders provide, besides just the sonar readings of the ocean. Knowing all the little things is so important, so make sure to pay attention to detail when you first purchase a fish finder. Now, it’s time to start learning how to read the fish finder results themselves. Some fish finders are in color, while others only support grayscale, or known as black and white. Color is closely related to how strong the echoes return to the transducer. Density and how hard an object is are both very important factors in echo return strength. The stronger the echo is when it returns, then the darker or stronger color used on the fish finder display. The seabed, or the bottom of whatever body of water you may be in, is often the darkest of most objects that you will encounter. The bottom of the lake, river, pond, or wherever you are may be either be a thick, bold line, or a thin, light line. If it is a light line, then it is a softer ground material like clay. A thicker, bold line means that the material on the bottom of whatever body of water you are in is a lot harder and usually less porous. This again ties into the whole idea of knowing the fish in the environment; some might be told that they are over clay and just shrug it off. Don’t just overlook these little details, because knowing how to interpret and use everything your fish finder tells you will improve your skill even more. After you understand how something that may seem trivial like color has such a large role in representing information, you can start trying to interpret fish finder results. The first thing you should do is set up your fish finder and move fairly slowly around any environment you can. Monitor the fish finder, and really just get used to the speed that you’ll be comfortable with when you’re done with all your test runs. Get used to looking at the display and familiarize yourself with the general feel of the whole process. Some fish finders display optimal results at different speeds, due to how the emit sonar waves and things like where they are mounted. Most fish finders, however, are better off at slower speeds. Once you’re used to having a fish finder mounted to your boat, manipulating the screen, and going the optimal speed, then you can get more specific. A fish finder will display its results from the right to left – the opposite of how you read a book that’s written in English. The most recent results will be on the far right of the fish finder’s display, and the oldest will be all the way to the left. This means that while you stay still, you should get a relatively stable image. If you’re moving, however, your fish finder will show you what is directly below the transducer at the right portion of the screen, and what you’ve already passed on the left side. You will need to get comfortable with the distance and general proportions from your vessel to the fish finder, but at this point, you should already be becoming more familiar with your device. You can set a custom zoom on a specific area if you only want to focus on what’s directly below you, or if you want to look more closely at one region. Now, it’s time to actually read the fish finder. You know what color means, and you know how to tell if something is under your boat or a few feet behind it. Now you need to understand what objects, fish, structure, schools, and other fish harboring objects may look like on your fish finder. There are two ways that a fish finder will display the sonar waves once they’ve returned to the transducer. Either the fish finder will show you the actual, raw data, or a program will convert these lines and arches into little, easy to distinguish icons based on what the fish finder sees. The first information display type for fish finders that this article will go over is Fish-ID technology. This is the technology that will convert the raw data into a much simpler and user friendly interface. You will see little fish icons where there are fish, often times different sizes, depending on the size of the detected fish. Some advanced Fish-ID systems will even have different icons for rocks, plants, and schools of fish. All you need to do is look for an icon on the screen, read the depth at which the icon is displayed, and cast! It’s so simple. If you see a large rock on your Fish-ID fish finder, and expect a certain species to be found around there, then that’s where you would cast. The simplicity of Fish-ID doesn’t come without a significant sacrifice, however. Fish-ID is generally much less accurate. A lot of the times, a Fish-ID enabled fish finder will display what is actually a group of plants as a school of fish, or a rock as a plant. This can be annoying, but if you would rather less time learning and more time fishing, then you should look into fish finders that offer this feature. 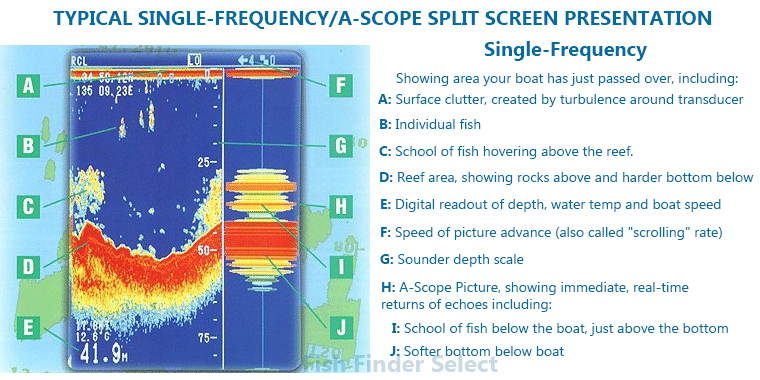 The second fish finder data display type is the raw data, or arch, fish finder. These fish finders will simply show what the transducer receives; lines and arches. They are notoriously hard to get the hang of, but once understood they can save a lot of time and are often worth the trouble. When a sonar wave is reflected off of a moving target, it is read as an arch. Stationary objects will be lines. Fish are generally going to be represented by these arches, with a much smaller margin of error than Fish-ID. The bigger the arch is, the bigger the fish is. Things like plants and rocks can be hard to identify at first, but once you get the hang of things, an arch fish finder is more accurate and is generally better. Arch fish finders are easier to explain, but much more difficult to use once you actually have one in front of you. It’s recommended that you take your time when learning how to use one of these fish finders, so you don’t just jump into things thinking you’re already an expert. Take your time, get comfortable, and actually take some time to learn. Once you start identifying arches, you may even be able to classify the fish based on their size and location. Once you get good with reading arch fish finders, you will overcome a major milestone in your development as an angler. Fish finders are complicated, but wonderful machines. They allow you to quickly locate fish and underwater structure, and make the lives of every angler that much easier. Hopefully this article was helpful, and taught you how to read a fish finder. i need arch fish finders, need the best and prices plus shipping and delivery think i got a major market for this stuff. link up for more info! Awesome post. A question I had In reference to the distance of the cone angle and distance of the cone at depth. In the example given above why do you vary between 2o and 60degrees. What is this, possibly frequency? Dual beam transducers emit 2 types of beams: a narrow beam with low frequency that can reach greater depth and a wider, higher frequency beam that can cover larger area. Good article. Not too techy and just the right amount of basics. The articles here helped me pick my new Garmin Striker Plus 5cv.